Portugal got past the Czech Republic this Thursday night, after pulling off a 1-0 late win, earned from a superb Ronaldo header. The Portuguese Team controlled most of the game, not allowing the Czechs to hit the target not even once! Leading the team was once again Cristiano Ronaldo, who besides hitting the posts twice, still managed to find the back of the net in one of those headers that no Portuguese or Czech fans will surely forget in the upcoming years. Portugal gave one more step forward in their quest for glory at this European Championship, after showing the exit door to the Czech Republic, in a tasty 1-0 victory. Once again, who else but Cristiano Ronaldo to rise to the occasion and decide the fate of the game, with one of those powerful headers that aren't within the reach of many other FIFA Balon d'Or candidates. Just like he did it against Holland a few days ago, Ronaldo proved he's fully commited with the Portuguese National Team and presented us with another top-tier performance. The Real Madrid's forward winning goal at the 79th minute, qualified Portugal to the EURO 2012 semi-finals, on which they'll now face either the all-mighty Spain or an always dangerous side as it is the French team. At this stage, the Portuguese Team seems to have at least already made enough to earn everyone's respect. Everyone was aware that the Czech Republic wouldn't play such an open game as Holland had done in the past weekend. All that space granted to Ronaldo, Nani and company was now expected to be a lot less, as the Czech Republic predictably prepared a very defensive strategy in order to respond to the Portuguese attacking threats. Moreover, with a semi-finals passage on the line, any chances of witnessing an open and attacking game were extremely slim. Nonetheless, the Czech Republic started the game slightly better than Portugal and they did find some space to explore between the Portuguese midfield and defensive lines. It didn't last too long though and as time passed during the first half, Paulo Bento's men slowly started taking over of the operations and controlling the game. Cristiano Ronaldo was actually the player who got the closest to score, after a receiving a ball on his chest and rotating in a way that put him in a 1-on-1 situation against Chelsea's goalkeeper, Petr Cech. Unfortunately, Ronaldo's shot smashed into the left post and the game would remain tied until the half-time whistle. The second half would start with the same overall trend, as Portugal kept dominating and creating chances and the Czech Republic struggled to held to the goalless draw. With only 3 minutes played in the second period, Cristiano Ronaldo got once again close to score, this time from a free-kick set piece. The Portuguese forward striked a powerful and accurate shot, that Petr Cech failed to block with his fingertips. However, the shot ended up hitting the post for the second time in that night and the Czech Republic had just survived another dangerous moment. Unlike the previous games, Portugal actually had more ball possession than their opponent (56% vs 44%), but what really surprises us are the stats concerning the shots made by both teams. The Czech Republic had 2 shots during the entire game and none of those actually went in Rui Patrício's direction. As for the Portuguese team, a total of 20 shots were made and 5 of those ended hitting the target. These numbers help giving credit to what would take place near the end of the game, as the Portuguese most shining star would appear again in the game and this time, there was no Petr Cech or any post whatsoever that could stop his intentions! With 79 minutes on the clock, there was clearly a growing sense of the need to play another 30 minutes floating in the air. But there was one man who hadn't give up just yet, even though posts have been denying him all his previous attempts that night... João Moutinho, who was extending his great display he had against Holland, came up with a great initiative to rush down the line and make a brilliant cross to the Czech Republic area. On the moment Moutinho lifted the ball from the ground, Cristiano Ronaldo sensed this was it and immeadiatly anticipated Czech Republic defender's Gebre Selassie, just before smashing the ball into the back of the net with an incredible and powerful header. 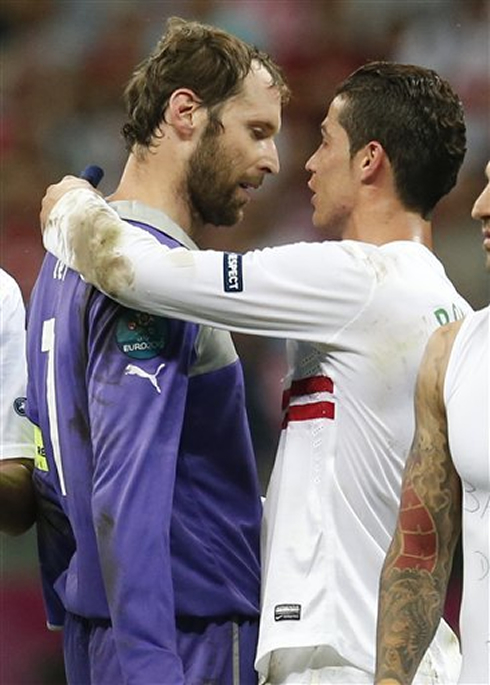 There was nothing much Petr Cech could have done in this situation, as Cristiano Ronaldo's nose for goal wouldn't allow the Portuguese to miss this chance for leaving his mark in the game. The game would drag to its end without any other noteworthy incident and Portugal managed to assure their qualification into the EURO 2012 semi-finals. The Portuguese team is now waiting to know who's going to be their next opponent, which will be precisely the winner of this Saturday's quarter-finals between Spain and France. The semi-finals involving the Portuguese Team will take place next Wednesday, the 27th of June. Real Madrid's season is now over and there are no games left in their schedule until the pre-seasons starts by July. Cristiano Ronaldo is now with the Portuguese Team at the EURO 2012 and the next game will be against the either France or Spain, in the EURO 2012 semi-finals, next Wednesday (June 27). In the meanwhile, you can watch Spain vs France, Germany vs Greece and England vs Italy, all from our football live streams section. Cristiano Ronaldo will certainly be on the line-up, when Portugal steps up to the pitch, for the EURO 2012 semi-finals.